Brinjal (noun): An Indian plant cultivated for its large edible, ovoid, glossy, usually purple-skinned fruit. 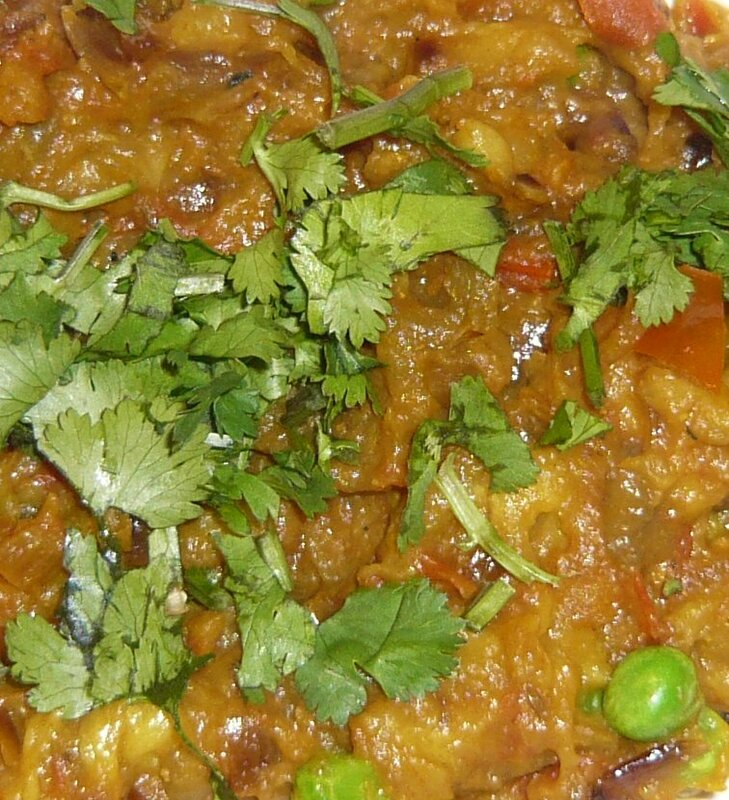 Eggplant or aubergine, brinjal or baingan? Never mind what it’s called, lots of men I know don’t seem to like this purple fruit very much. (Growing up, we ate moussaka and other eggplant favorites only on the nights that my Dad was out playing bridge.) Only Indian men seem to truly relish the eggplant. 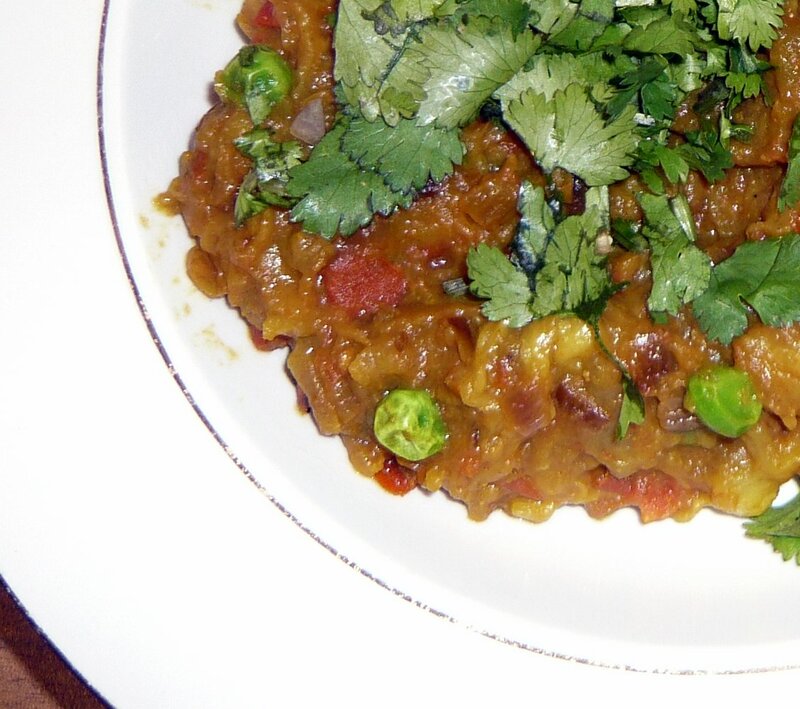 As the fruit is native to India, perhaps we had best look to that country for a tempting baingan recipe. 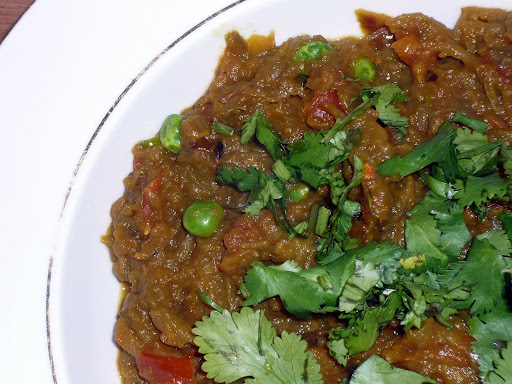 The first step of every baigan bharta recipe is to cook the eggplant whole. This is done either by roasting the eggplant on a rack in a moderate oven or by sitting the eggplant directly on top of a gas burner. We’ve tried both in the past. Generally, P and I think that the cook top method is best. However, we decided to stage an objective test, so P invited Aashvin to dinner to be our blind judge. Aashvin sat in the lounge and watched The Apprentice while we cooked the following recipe in double quantities with each eggplant. 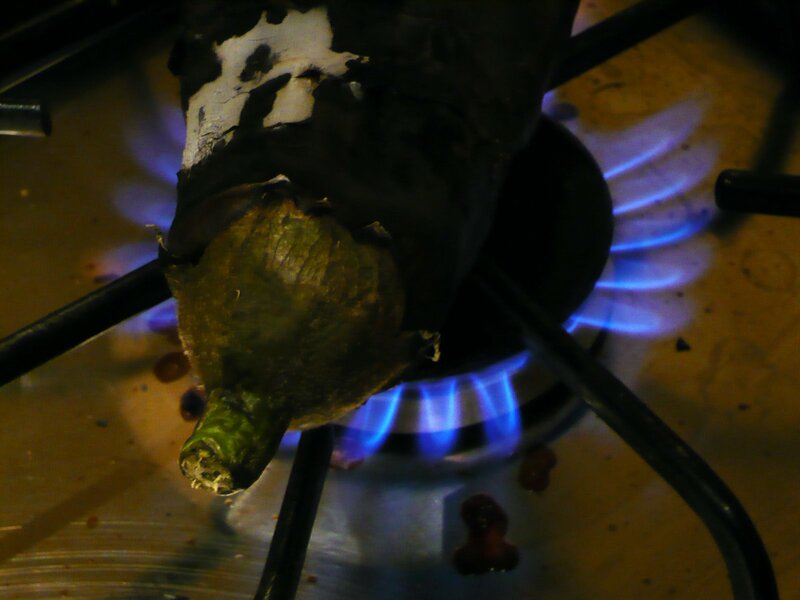 Place the whole eggplant directly onto the wire, above a middle-sized gas burner on moderate flame (see left). 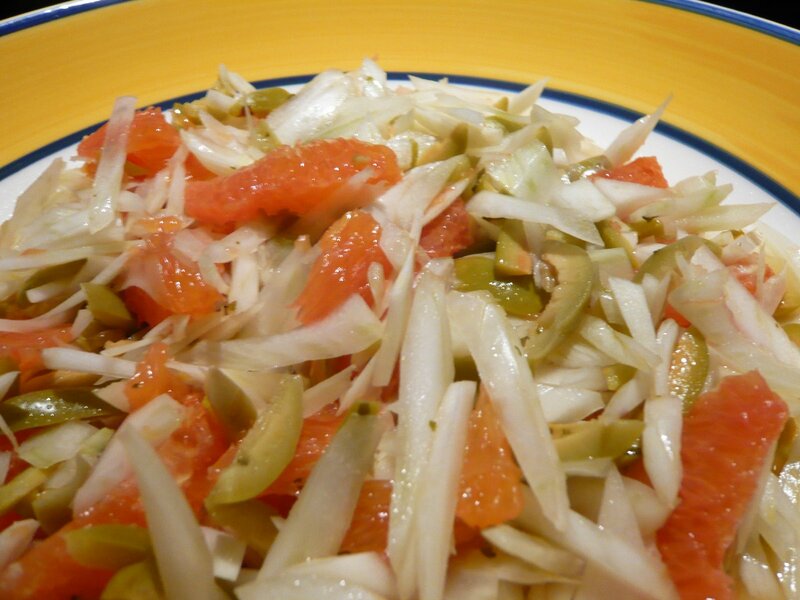 Rotate frequently, until the skin is black and flaky and the whole fruit is soft and mushy. Let the eggplants cool slightly and then peel of the skin and roughly mash the flesh. Saute the onion and the green chilies until soft. Add the dried turmeric, coriander and chili-powder and fry for another 2-3 minutes. Stir in the tomatoes and cook on a medium flame for 7-10 minutes. Stir in the brinjal. Stir in the peas. Garnish with fresh coriander. Poor, poor people who only have electric cooktops. for ghee and all the necessary herbs and spices.